There are friends you trust and those you don’t. There are co-workers you trust and those you don’t. There are probably even family members you trust and those you don’t. And for me, there are cookbook authors I trust and those I don’t. In case you are curious, I trust Deborah Madison, Jeanne Lemlin, Ina Garten, the people at Cook’s Illustrated, and I trust Martha Stewart. Let me say this, I am not a Martha Stewart kind of gal. I am not neat, or crafty, and I have never been to jail. (Both my brothers have though. Another story for another time.) But I do love to cook and I very much appreciate a well-written cookbook with well-tested recipes. There is the theory that, when cooking for guests, you should only make familiar recipes. Being a personal chef for three years (!) who very rarely repeats menus has forced me to make all kinds of things I have never made before. Every so often I make something and wonder – is this going to be any good? If it has come from one of my trusted books, it always is. Two books I use on a regular basis are the two volumes of The Martha Stewart Living Cookbook. Some of my favorites have come from these huge tomes. Everything I have made turns out well. The recipes are clear and concise and many of them are truly delicious. 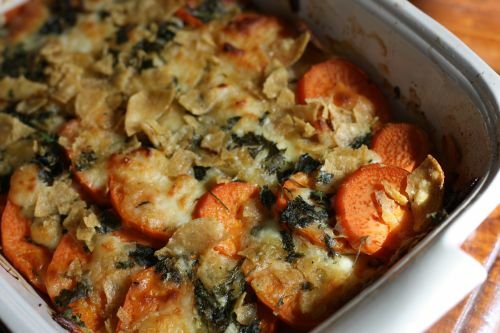 I made this gratin last night for my clients and for my friend John who came to dinner. When I pulled it out of the oven, I wasn’t sure. It smelled good and I knew I liked all the ingredients in it, but I just didn’t know how it would come together. But, because it came from Martha – or from the people who write her cookbooks – I didn’t worry. And it was delicious – smoky and sweet, cheesy but not too rich, and just a bit of spice. I served this as a main course with red beans and rice and a citrus salad, but it would be lovely as a side dish as well. A few words about the recipe. The next time I make it (and there will be a next time), I will make three layers instead of two. This will no doubt require a bit of squishing because the pan was quite full with just two layers, but it bakes down considerably and I would have loved another layer. Even if you do not like spicy food, do not skip adding the chipotle chile. Martha says it is optional but I say the smokiness that it lends to the dish is essential and it is not too spicy. If you like spice, add another one. 1. Preheat oven to 350 degrees. 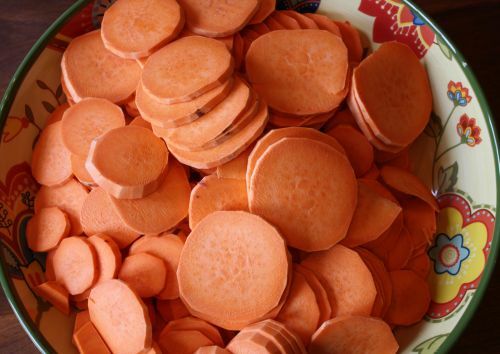 Arrange half of the potatoes in a 9 x 13 baking dish, overlapping the slices. Sprinkle with half of each cheese. Top with onion. 2. Stir the chipotle into the stock or water; drizzle over the onion. Sprinkle with half the cilantro. Top with the remaining potatoes; sprinkle with the remaining cheeses and cilantro. Scatter the chips on top. 3. Cover with foil; bake 30 minutes. (DT: I sprayed my foil with non-stick spray so the cheese wouldn’t stick too much.) Remove the foil; bake until very tender and top is well browned, about 30 minutes more. Let cool slightly before serving. Serve with limes and crema, if desired. Ah, gratins. I just hear that word and I think “rich”. Of course, they don’t have to be. 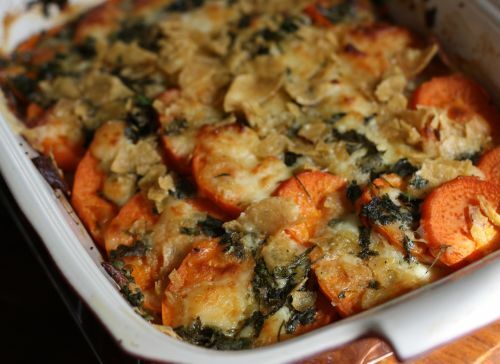 A gratin is typically some kind of layered dish that is baked in the oven. I have made healthy gratins with beans, tomatoes and homemade breadcrumbs or with lots of vegetables and no cream or cheese. This is not one of those gratins. Leave it to Ina Garten of Barefoot Contessa fame to make the richest creamiest cheesiest gratin I have ever had. There is no restraint here and every single calorie and gram of fat is worth it. I first made this for my clients Stephanie and Mark last Thanksgiving. As it was baking in the oven and tempting me with the unbelieveable smell of potatoes, cream and Gruyere cheese all mingling together in exquisite harmony, I resolved to make it for Thanksgiving this year. When I brought it over to them, Stephanie had to hide it from Mark so he didn’t eat it before the holiday. I am always a fan of things can be made in advance, holiday or not, and this was great two days after it had been made. Just be sure to warm it up adequately and you also might want to put the dish on a baking sheet in case any of the cream (yum!) bubbles over. Even if you think you don’t like fennel, do not skip it in this dish. It’s flavor is very subtle and sweet and helps cut the richness of the dish – a little bit. Do not be tempted to scale up this recipe as I did. A little goes a long way. 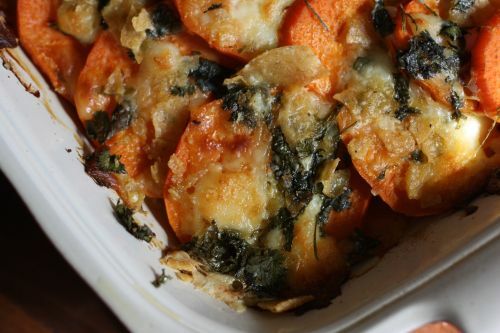 Garten originally calls for russet potatoes in this dish and she suggests that you peel them. I used Yukon golds and did not peel them and the texture was perfect. I also covered the gratin for the first half of the baking so it didn’t get too brown. Preheat the oven to 350 degrees. Butter the inside of a 10x15x2 inch (10 cup) baking dish. Thinly slice the potatoes by hand or with a mandoline. Mix the sliced potatoes in a large bowl with 2 cups of cream, 2 cups of Gruyere, salt and pepper. Add the sauteed fennel and onion and mix well. Pour the potatoes into the baking dish. Press down to smotth the potatoes. Combine the remaining 2 tbsp. of cream and 1/2 cup of Gruyere and sprinkle on the top. Bake, covered, for 45 minutes, then remove the foil and bake for another approximately 45 minutes, until the potatoes are very tender and the top is browned. Allow to set for at least 10 minutes and serve. Of the four tastes available to a person, bitter is my least favorite. Well, right, like I was going to say sweet? But really, I’m not a fan of some of the things that other people love. The chicory family for example. Endive, radicchio, escarole? Not so much. Brussel sprouts? Just too bitter for me. Or so I thought. I recently grilled radicchio for use in a salad and the heat brought out more sweetness in a vegetable that I had, up until recently, only tolerated. Similarly, I thought I disliked brussel sprouts having only had them boiled or undercooked – in other words, bitter. Last Thanksgiving, a certain recipe where you saute them until brown and sweet turned me in to a brussel sprout supporter, and now I find that I actually crave them. I used to think turnips were on the black list. Bitter bites again. But I was wrong wrong wrong and it wasn’t even that I needed to blast them with high heat, or saute them with an indecent amount of butter. I just needed to use different turnips. When all you have tasted are those big fat turnips you find in the grocery store roughly the size of baseballs, you can forgive yourself for thinking you don’t like them. Now I’m sure those have their place in the culinary world, or are the favorite vegetable of someone who loves bitter food. But the adorable little ones that you can find in the local farmer’s markets now, those are something else entirely. So tender and delicate that you don’t even need to peel them and, when cooked, just clean and light with a hint of earthiness. Today I made a Turnip and Leek Gratin with Blue Cheese to highlight these beauties. It is a lovely and simple recipe and it fills your house with the most amazing creamy and cheesy aroma. Along with the Gratin, I made a Rice Pilaf with Chickpeas and Currants, and an Arugula Salad with Strawberries and Hazelnuts. You might be wondering…arugula? That’s awfully bitter for someone who says she doesn’t like bitter. I know. But arugula is #11 on my Top 10 Food List – maybe even #10, I don’t know. (I might need to do some shuffling). It is bitter but in a way that I love. I also really like radishes so I definitely can’t write bitter off for good. Anyway, I am going to start a feature in this blog called “Let’s Talk About…” where I will de-mystify an ingredient or technique. So, let’s talk about leeks for a moment as they are an important part of the Turnip and Leek Gratin. Leeks are one of my favorite vegetables period and so under-used. What are you looking for when you buy a leek? Most recipes will tell you to only use the white part or, at most, the white and very pale green part. So you will want to look for leeks that have a long white part. Sometimes, that will not be an option so I would suggest buying more than you need so you will have enough white. What can you do with those pale green parts that you are not using but that you paid good money for? My best suggestion is to use them for a vegetable stock. If you can’t be bothered to make a stock right this minute, just wrap them well and put them in the freezer. I suppose you could use the dark green leafy parts in the stock too, but they are awfully sandy and I just haven’t ever had the energy to wash them well enough. Most recipes will tell you to slice the leek in half lengthwise and wash it under running water. This is to remove the grit that can become lodged in the lovely leek layers (say that 10 times fast). Preheat the oven to 375 degrees. Rub a 2 quart gratin dish with the garlic, then with butter. Heat the half-and-half with the remains of the garlic, 2 sprigs of thyme, and the bay leaf. When it’s close to boiling, turn off the heat and set aside. Cook the leeks in 2 quarts of boiling salted water for 2 minutes. Scoop them out and allow them to drain in a colander. Add the turnips to the water and cook for 4 minutes. Remove the leeks to a bowl and drain the turnips well in the colander. Layer the vegetables in the dish, intersperse the remaining thyme sprigs among them, season lightly with salt and pepper, and add the blue cheese. Pour the half-and-half through a strainer over the top. Bake, uncovered, until the cream is absorbed and the top is browned, about 30 minutes. Dana’s Note: I doubled this recipe and baked it in 4 mini-loaf pans. I baked it for 45 minutes total.